Fans of the classic dice game Yahtzee rejoice! 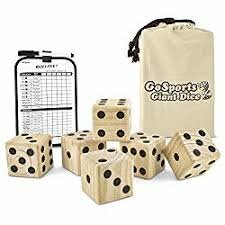 Our Giant Yard Yahtzee rental delivers the classic party experience in a fun, oversized package! Each dice features a high quality wooden surface along with easy-to-see dots. This rental comes with everything that you need to get started, including the dice themselves, a large dry-erase scoreboard, and a carrying/storage case. Don’t delay and reserve the Giant Yard Yahtzee via our online booking system today! If you’re having a weekend event, let us know if earlier delivery works too. When possible, we can sometimes deliver your rental one day in advance and at no extra cost!